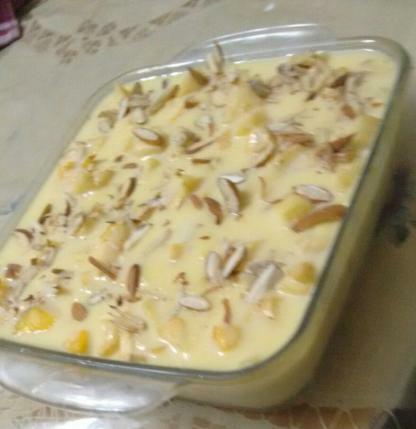 Custard is one of the easiest and most loved desserts for any occasion. And the best part about it is, that you can transform it into a variety of puddings with a few simple tweaks. Here one such quick and easy twist to the regular custard that yields a delicious trifle pudding to grace special occasions. Prepare the custard first. Reserve ½ cup milk and pour the remaining in a saucepan. Dissolve the custard powder in the reserved milk. As soon as the milk heats up (don’t over-boil), reduce the heat and add the sugar in it. Also pour in the dissolved custard. Stir the custard solution and let it get heated nicely. Stir frequently over low heat until the custard thickens slightly. Then turn off the heat. Remove the pan from the heat and allow the custard to cool down to room temperature. Then place the saucepan in the fridge for half an hour to slightly chill and set the custard. To plate up, arrange the sponge cake slices on the base of a glass serving dish. Pour cooled custard over the cake and smoothen with a flat spatula. Spread chopped fresh fruit over the custard layer. Pour another layer of the cooled custard over the fruits and smoothen with spatula again. Finally pour the remaining custard on top and smoothen. Sprinkle assorted dry fruits on top and then place the dish in the fridge until serving. When ready to serve, scoop out custard trifle such that a little bit of each layer is included in each serving. Tip: You can also plate up the trifle in individual serving bowls by placing a single cake slice at the bottom of each bowl and then forming layer as described.